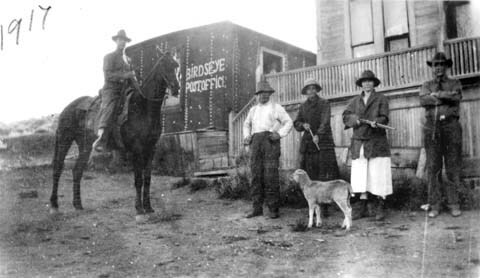 A post office was usually the only institution necessary to be considered a town in Wyoming. And thus many “towns” sprang up with a population of 1…the postmaster. And many died when the post office was discontinued. Take Birdseye for example. Originally it was a stage station, but it served as a post office from 1906-1913. The post master estimated a population of 50 in the area, but served about 200. Nowhere near 50 lived in the town’s 3 buildings and a lean-to. 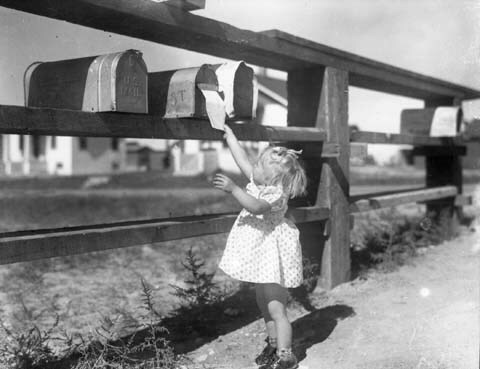 Before phone calls were cheap and well before the internet, the mail call was something to look forward to. 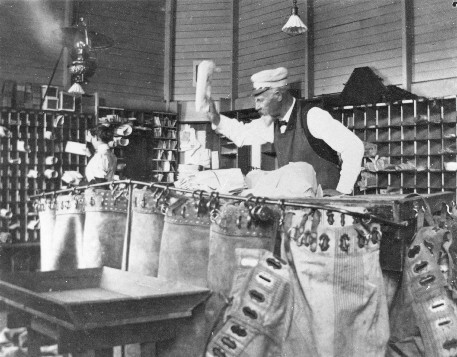 Postmasters, like Perry Smith of Rawlins, were sometimes almost an institution in themselves. They kept the mail on schedule. As technology advanced, so did the mail system. 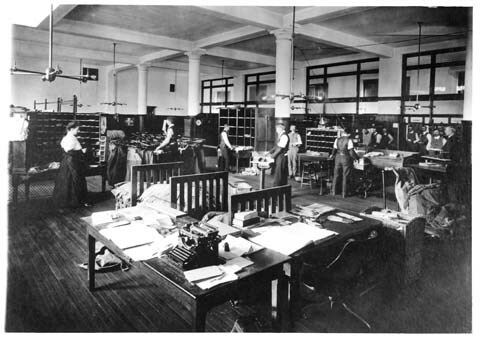 From sorting by hand to today’s automated sorting machines, the USPS continues to modify its mechanisms. But the sorting room has always been the sorting room. Wyoming’s airmail beacons even inspired the 5 cent airmail stamp used from 1928-1930. The artwork on the Beacon stamp depicts a plane and an airmail beacon that closely resembles the one at Sherman Hill, between Cheyenne and Laramie. This was the highest beacon of the 1,500 on the route. According to Gallagher and Patera’s book Wyoming Post Offices, 1850-1980, 1,100 names have been used for post offices. 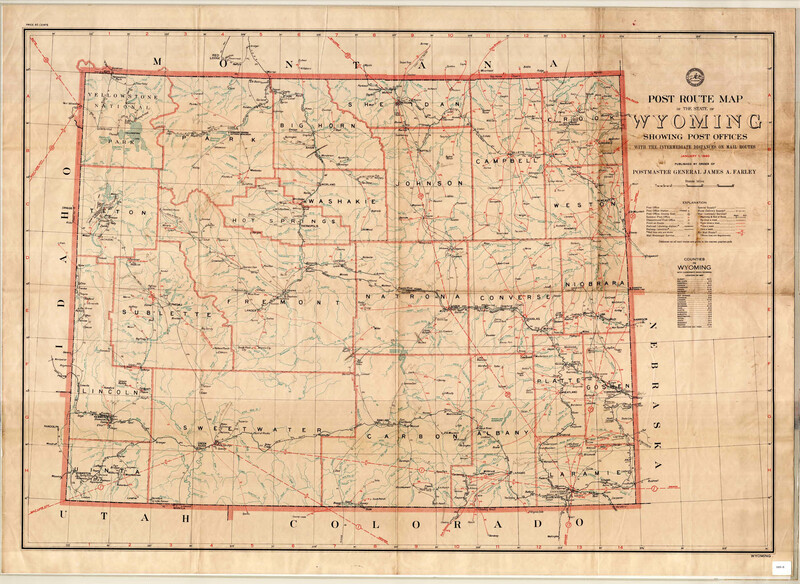 There were 16 in existence in 1869 when Wyoming became a territory and over 200 at the time of statehood in 1890. Currently, there are about 153 post offices. But if you take a closer look (or scan it at an absurdly high resolution) the image gets a bit more interesting. Detail of the lantern slide above. Once the buildings can be identified, it is pretty clear that you are looking south down what would be Capitol Avenue at the back of the Capitol Building. This picture happens to be of Cheyenne, taken from north of the Capitol Building looking back towards town. 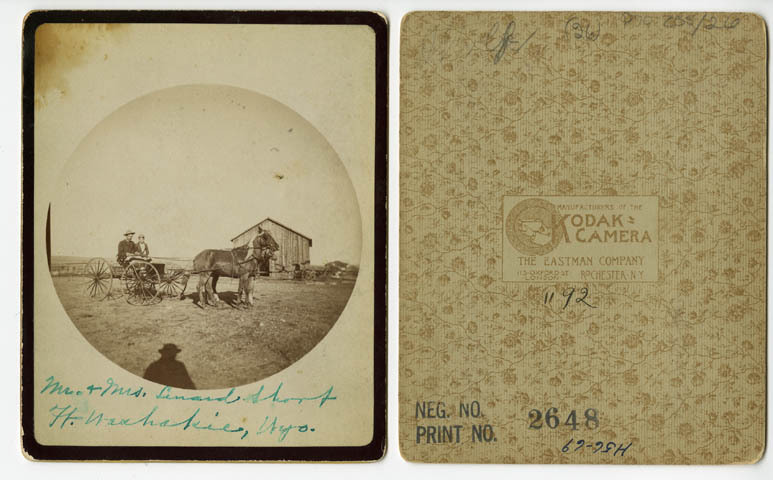 The photo was probably taken between 1905 and 1910. The large building just to the left of the Capitol Building is the Convent and Academy of the Holy Child Jesus, run by sisters from the Society of the Holy Child Jesus. The building was completed in 1886, the same year construction began on the Capitol Building, and was replaced in 1952 by the St. Mary’s Grade School building. This lot has since been transferred to the State of Wyoming and is currently being used as a parking lot with the eventual plan to construct a State office building on the site. The Masonic Temple, built in 1903, is clearly visible on the right. The current roof line of the building is a bit different from this original one, thanks to a fire around 1911. The road on the far right of the photo is Carey Avenue, thought at the time it was known as Ferguson Avenue. 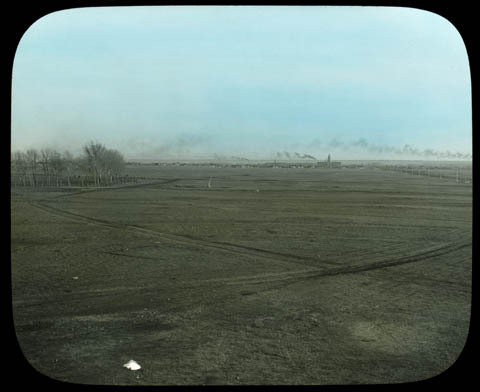 Many of the cattle barons built their mansions along this road, earning it the moniker “Millionaire’s Row.” If you were to follow this road to the north out of this frame, you would find Frontier Park, home of Cheyenne Frontier Days. 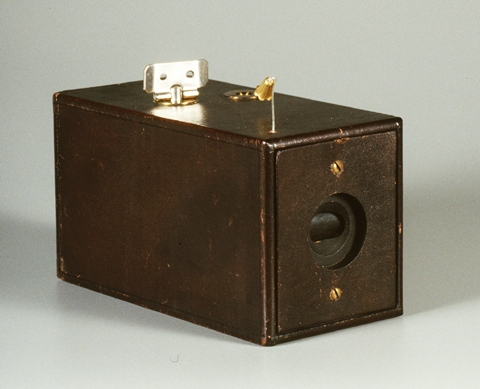 Lantern slides like this one were designed to be projected onto a screen or wall. The blue and green tinting of the slides was an attempt to make it look more realistic in the era before true color photographs. 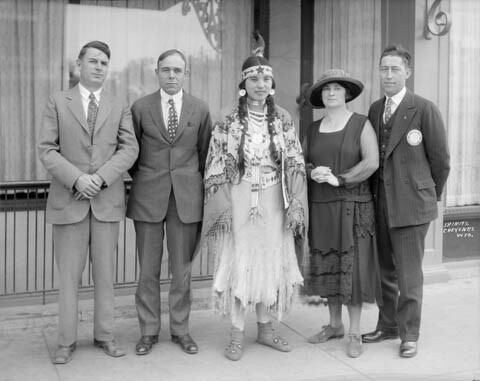 On September 16, 1926, Native American beauty queen Jessie Jim stopped in Cheyenne on her way from meeting President Coolidge in Washington, DC, back to her home in Washington State. 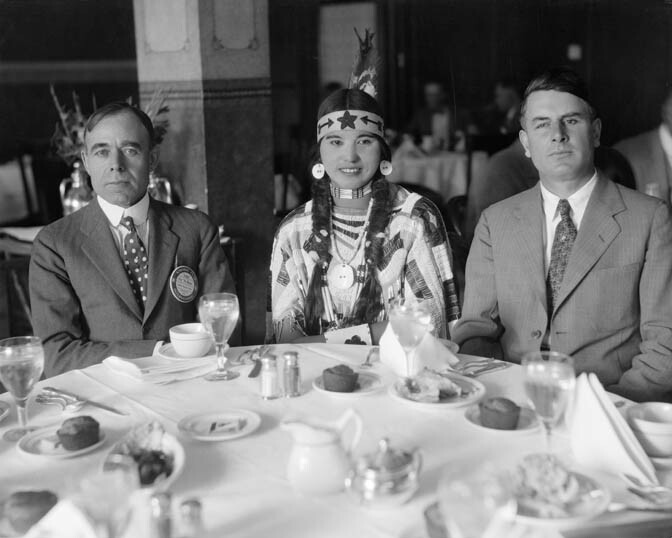 Princess Jessie Jim had won the title of Princess America II earlier that year at the Spokane Indian Congress. The beauty pageant was open only to full-blood Native Americans. Many young women entered the contest, but Princess Jessie Jim was chosen as the most beautiful of them all. According to the newspapers, Princess Jessie Jim was the daughter of Okanogan Chief Long Jim. 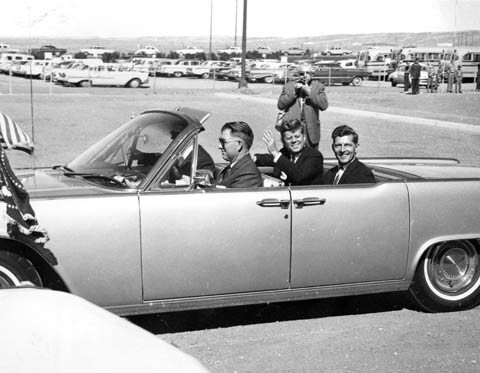 As Princess America II, Jim toured the country on her way to the annual pageant in Atlantic City, New Jersey. Whether she was there to compete or simply to appear in not known. She stopped at several towns along the route for official appearances, but apparently did not speak at many. 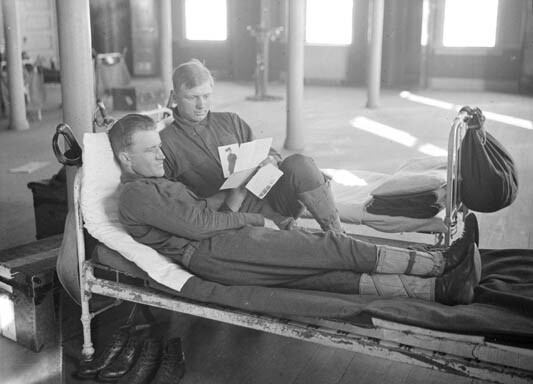 Her traveling companion and chaperon was Miss Avis Lobdell, a representative from the Union Pacific Railroad. 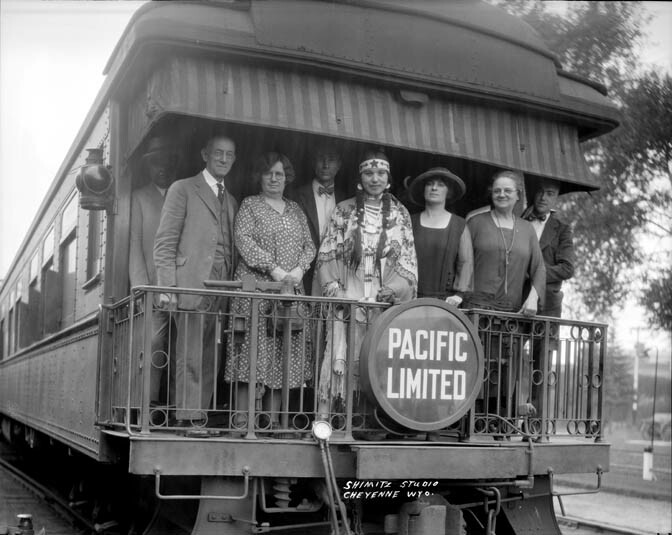 On her return trip, she was met in Cheyenne at the Union Pacific Depot by a stagecoach and several local representatives, including Judge Fred L. Blume, acting for Governor Nellie Tayloe Ross, and Sam M. Thompson, acting for Cheyenne mayor John Riner. After lunch with the Kiwanis club at the Plains Hotel, Princess Jim was shown the town from the stagecoach before she boarded the train for Salt Lake City. We regret to inform you that today is Opposite Day! 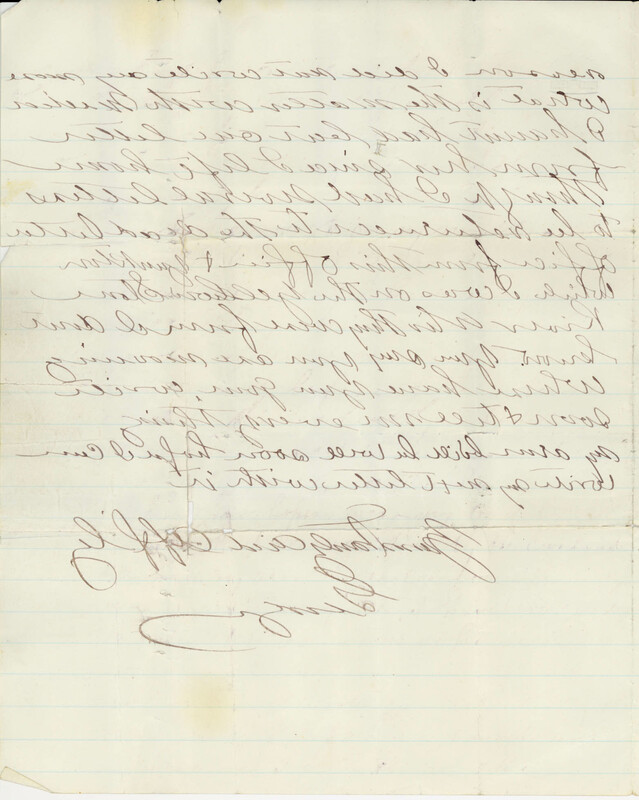 To celebrate, we’d like to share a letter from the collection, written (how else?) backwards. 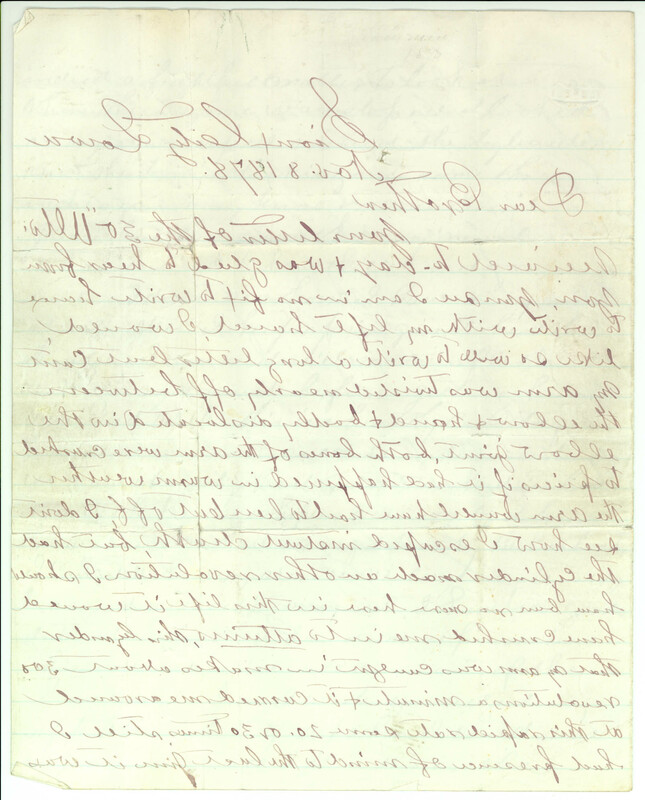 This letter was written November 8, 1878, from “George” to his brother “Jim” while George was recovering from a steamboat accident near that almost took off his right arm. 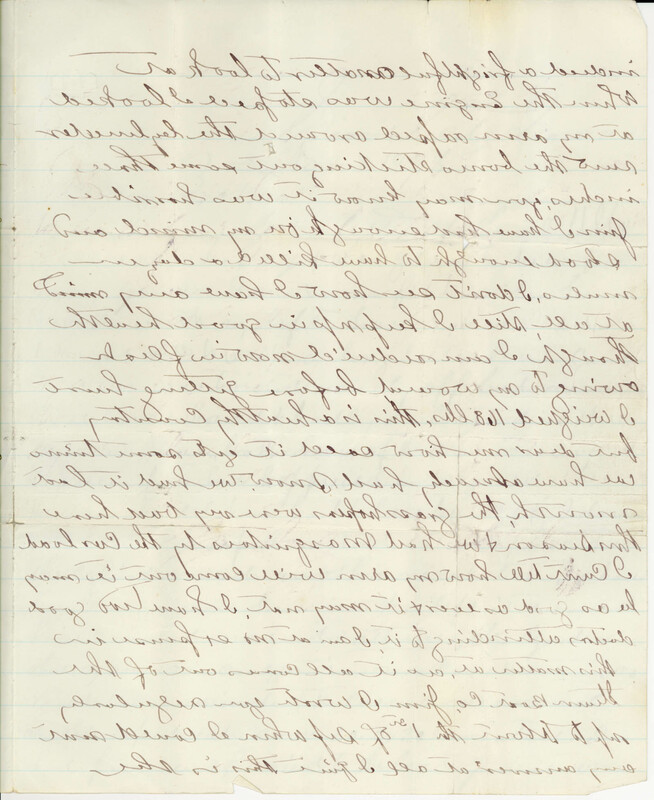 George tells his brother that he regrets that he cannot write a longer letter, but he is writing with his left hand and thus backwards. Mazzal tov to the happy couple! On September 5, 1894, the first Jewish wedding in Wyoming as officiated in Cheyenne, making today the couple’s 120th anniversary. Louis D. Jacobs married Miss Sylvia Adamsky at her parent’s home. 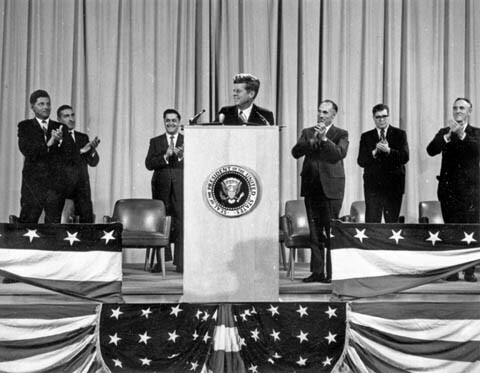 The ceremony was officiated by Rabbi H. Saft of St. Louis, Missouri, who was also Louis’ uncle. Louis and Sylvia had met in Cheyenne, where she had grown up. Louis’ family had briefly lived in Cheyenne before moving to Deadwood. They had both attended Cheyenne High School and Sylvia had graduated from there in 1888 with a stellar academic record. She was well-known around Cheyenne as a stellar speaker and musician. Louis was a budding salesman in South Dakota. The event was auspicious enough to be described in detail in both Cheyenne newspapers. The chuppa, or ceremonial wedding tent, was held by four young men, two of whom also served as official witnesses, and the service was conducted in a mix of Hebrew and English. The newspaper accounts of the wedding included a short introduction of the couple, a description of the ceremony as well as a list of the wedding presents received by the bride and groom. After the ceremony, the couple honeymooned in Illinois before settling in Deadwood, South Dakota. Their happiness was unfortunately short-lived. Louis died in 1903 from pneumonia, leaving Silvia to care for their 2 small boys, Ralph and Morris. 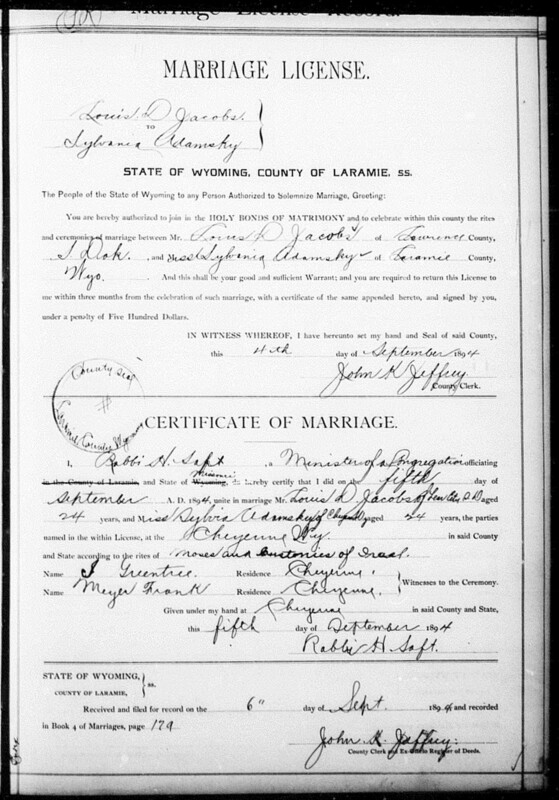 The Laramie County Clerk’s records include a copy of the couple’s marriage license.